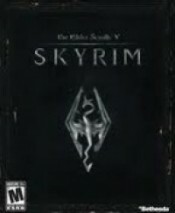 Skyrim, The fifth installment of the Elder Scrolls series brings forth a vast world with a wide variety of possibilities. Oblivion, the game before Skyrim, had amazing reviews and some people seemed to be addicted to it. “Oblivion was amazing, I still even play it once in a while even though it came out so long ago,” said senior Liam Kline. “I used to play Oblivion 24/7,” said Bob Warfel. “I could never get into playing Oblivion, but the newer one, Skyrim, is supposed to be really good and I’ve heard it got amazing reviews,” said senior Alex Sorce. The new Elder scrolls is a RPG (role playing game) that sets you off as the last living dragonborn, a mortal who is born with the soul of a dragon. 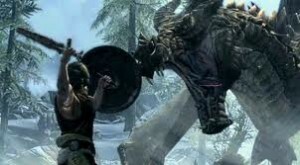 As a dragonborn you have the ability to absorb the power of a dragon after it is killed and learn special skills called dragon shouts. Skyrim starts off with you being detained, and transported to a village. After arriving, you are removed from a cart where two other prisoners are also being held. A guard is reading off the names of the prisoners but you are not listed. At this time he asks you your name. After being asked your name you are taken to a character creation screen where you can choose from a variety of races. The customization options in this game are more visually appealing than those in oblivion. Facial features are very in-depth and battle scars and war paint can be added to give your character an edgy look. After creating your character, you listen to the chatter of guards and the roar of a dragon can be heard in the distance. Moments later, the village you are at is being bombarded by fiery breath and you are able to make a quick escape. Soon after, you find yourself running through a cave learning basics and getting a feel for combat. Skyrim also has a new feature, unscripted dragons. Meaning that during your unimaginable quest, you are bound to run into a dragon sooner or later. The only thing the dragons will not be able to do is harm the main cities. The dragons are huge and able to shoot fire or ice at your character. “The new combat style seems pretty sweet and you can now combine two spells together to make a single strong spell,” said Zell. “Skyrim seems pretty legit,” said senior Jake Mercado. New features to the combat system include the ability to dual-wield one handed weapons, use a different spell in each hand, and a melee hit with the bow. “I’m pretty excited to play it, the games before them were always fun,” said senior WIll Downs. As you level up skills in Skyrim, from crafting to combat, you gain experience to your overall level. When you do level-up you unlock points that can be spent on perks that enhance individual skills. Perks can be a big buffer to how you play. If you put perks into the archery skill for example, you can get bonuses such as a zoom feature and upgraded damage with a bow. This doesn’t limit your options. It actually gives players a chance to specialize in their play style. The World of Skyrim is huge and very detailed. The Bethesda team definitely worked very hard to create such a place. The game has over 300 hours of game play to keep you busy and keep the experience fresh.